As their ranks have swelled in the past several decades, immigrants have come to play an outsize role in U.S. fertility, accounting for almost one-fourth (23%) of babies born in the United States (but just 14% of the overall population). A new Pew Research Center report examines long-term trends in U.S. births among both U.S.-born and foreign-born women, and the growing gap in the share of births outside of marriage between the two groups. The report also looks at how the financial and demographic profiles of new mothers vary depending not only upon their nativity, but upon their region and country of birth, as well. 1The increase in U.S. births since 1970 has been driven entirely by births to immigrant mothers. In 1970 the annual number of U.S. births stood at 3.74 million. By 2014, the number had risen 7% to 4.00 million. During that same time, the annual number of births to immigrant women tripled, from 274,000 to 901,000. 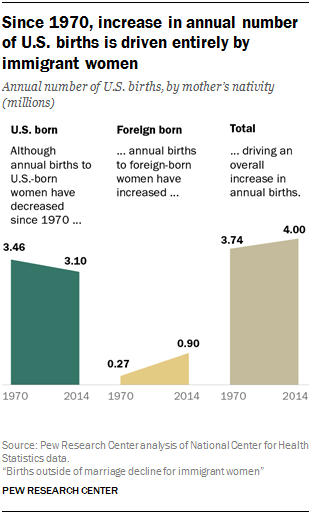 Meanwhile, births to U.S.-born women declined from 3.46 million to 3.10 million. In other words, were it not for the increase in births to immigrant women, the annual number of U.S. births would have declined since 1970. 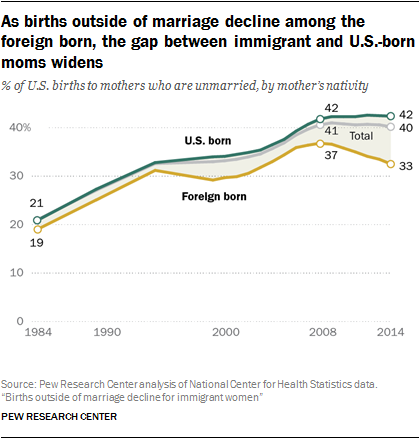 2 U.S. births outside of marriage have declined since 2008, primarily among immigrant women. Over the long term, nonmarital births had been on the rise in the U.S. In 2014, 40% of all U.S. births were to unmarried women, up from 21% of births in 1984. Among foreign-born women, the share of births that occurred outside of marriage hit a high of 37% in 2008 and has since fallen steadily. Among U.S.-born women, the share of babies born outside of marriage has held steady over that same period. While foreign-born women have always been less likely to have babies outside of marriage than U.S.-born women, the roughly 10-percentage-point gap in this measure in 2014 (42% vs. 33%) is the widest since data became available in 1984. 3 The decline in unmarried births to foreign-born moms is due in part to their changing regional origins. In recent years, the share of babies born to moms from Latin America has declined, while the share of babies born to moms from regions such as Asia has increased. 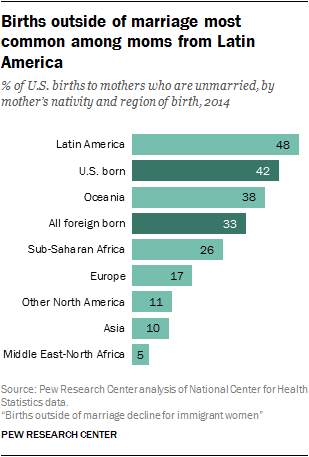 New foreign-born mothers from Latin America were roughly four times as likely as moms from Asia to be unmarried in 2014. This shift reflects a larger change in U.S. immigration: Asia recently replaced Latin America as the largest source of new immigrants to the U.S.
4 Women from nine countries and one American territory account for more than half of all babies born to foreign-born women in the U.S. 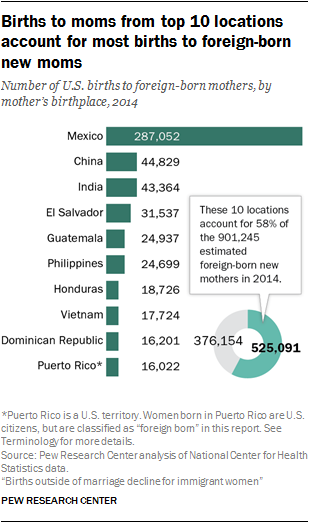 Births to women from Mexico, China, India, El Salvador, Guatemala, the Philippines, Honduras, Vietnam, Dominican Republic and Puerto Rico accounted for 58% of all births to immigrant mothers in the U.S. in 2014. 5Beyond marital status, new immigrant moms vary dramatically on a variety of characteristics depending on where they are from. 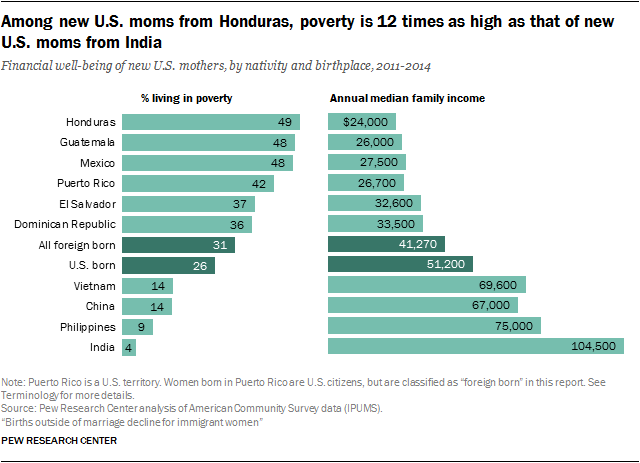 For instance, about 4% of new foreign-born mothers from India – one of the top 10 countries of origin among new foreign-born moms – are living in poverty, compared with 49% of new mothers from Honduras. And new mothers from Vietnam, the Philippines and China are particularly likely to be older mothers. The new foreign-born mother’s likelihood of being married also varies significantly: Two-thirds of births to mothers from Honduras occurred outside of marriage, while virtually all births to Indian moms occurred within marriage.